Officer Daniel Rausch (left, with Chief Steve Stahl) was key to the development of MPD's on-body camera program and was named Officer of the Year. 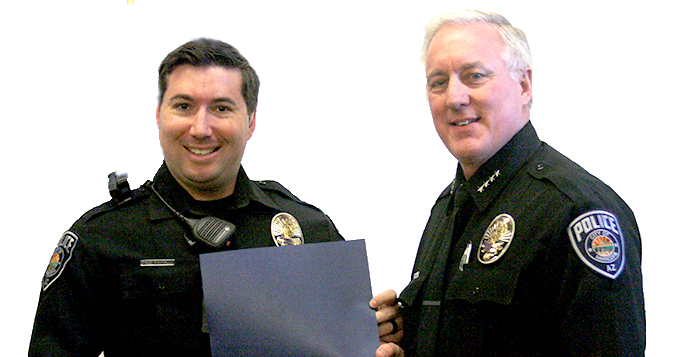 The Maricopa Police Department has named Officer Daniel Rauch as the department’s “Officer of the Year” for 2015. Over the last year, Rauch has been an active patrol officer, was selected to represent MPD by working in a detail with the U.S. Marshal’s Office and Tempe Police Department, and was the test subject for both the MPD on-body camera program and license plate reader program. Maricopa Police Chief Steve Stahl compared Rauch to the Energizer bunny. He is always open and available for new tasks, and whenever he is needed, he is there. According to an MPD statement, Rauch exhibited a willingness to go above and beyond the call of duty as both an officer and a member of the Community Action Team. Rauch was also commended for his stellar communication and treatment of members of the community.